Sometimes the best way to experience a destination is to tap the shoulder of a local and let him or her show you locations that speak to an area’s history and traditions. Finding that authoritative local voice isn’t always easy; so visitors will frequently opt for a tour. Whether by boat or land, Laughlin offers numerous memorable tour experiences run by local operators and people who know and love Laughlin’s rugged terrain and history like no one else. Here are five tours to consider for your next Laughlin getaway. 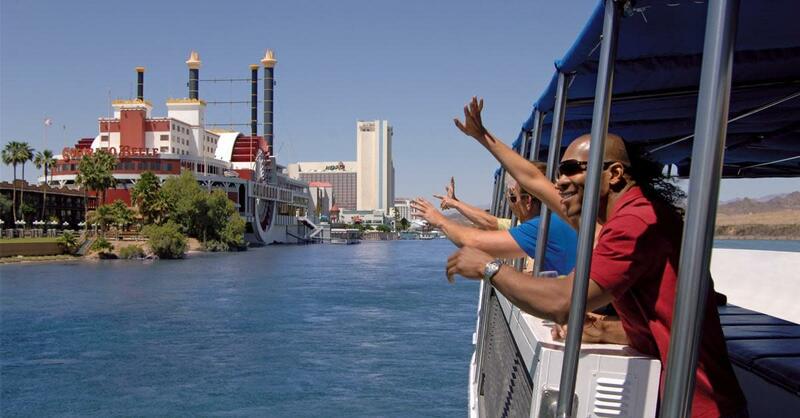 Departing from the Riverside Resort & Casino, daily tours of the Colorado River on the U.S.S. Riverside include guided narration that touches on the area’s history and roots. The boat has a shaded upper deck and a climate-controlled lower deck. Tours are designed to take riders under the Laughlin/Bullhead City Bridge all the way to Davis Dam. The U.S.S. Riverside can also be booked as a charter for weddings and parties, and the vessel has a full-service bar as well. Few know the art of the day trip better than Mills Tours. The company takes visitors to the Grand Canyon’s West Rim to enjoy the Skywalk or the South Rim to take in a memorable sunset or hike. One tour visits three unique museums and other outdoor adventures expose the majestic desert beauty of area mountains, canyons and waterways. Trip lengths vary between four and 10 hours and can accommodate two or more passengers. Advanced reservations are recommended. Enjoy the Colorado River on the “Celebration,” a luxurious touring boat that departs three to five times daily from the Aquarius Resort and Casino. The Celebration offers the only dinner cruise available on the Colorado. The boat is fully climate controlled and can be booked for parties, events and wedding celebrations. Dinner cruises are an intimate experience where visitors can enjoy a meal, cocktail and incredible views of the water. The Celebration also runs 90-minute scenic cruises during the day, which narrate area history as well. The 112-passenger vessel also has a full-service bar. Enjoy a 58-mile tour of the Colorado River in a 900-horsepower jet boat that climbs to 40 miles per hour. Witness some of the West’s most wondrous attractions. Only accessible by river, Topock Gorge features breathtaking views of volcanic rock faces, emerald waters, ancient Indian petroglyphs and amazing desert wildlife. Visitors also enjoy a two-hour layover at the beautiful London Bridge in Lake Havasu City, Ariz., where they can sightsee, dine and shop. Jet boat tours depart daily from the Pioneer Hotel and Gambling Hall, Edgewater Casino and Harrah’s Laughlin. For a candid glimpse into the area’s majestic beauty, Laughlin Tours LLC offers five different tours, including one that’s a journey to the bottom of the Grand Canyon while also experiencing the historic Route 66. Another tour ventures to the West Rim’s Skywalk while a different Grand Canyon tour has a railway option, too. Each experience includes a guide and Laughlin Tours offers to pick up visitors at area hotels and casinos.